Situated just an hour south of the Channel ports of Calais and Boulogne-sur-Mer, St Valery-sur-Somme (80 Somme, Hauts de France) offers not only a first or last stopover to/from more distant French destinations, but is also worth a visit in its own right. This is where the River Somme enters the English Channel (or French Manche!) on the Bay of the Somme. The river here has widened and slowed, and its peaceful meanderings become a real haven for wildlife and birds. 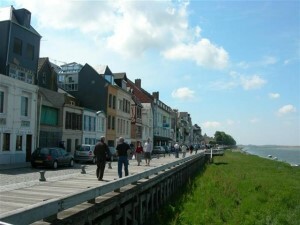 The small town of St Valery offers a riverside boardwalk from which many birds can be sighted on the opposite bank and marshland – with a view over to le Crotoy on the northern side of the Bay. There is something about watching the river, the tides and the birds which induce a sense of calm and peace. The town is attractive with a good selection of shops and restaurants – none of it too fussy or expensive – there are a few shops offering freshly caught fish and shellfish – and there is plenty of gentle walking on offer along the river, past the old fortifications and out to the estuary. Although inevitably busy in high season, it feels genuine and low key. If you don’t want to walk every time. there is a steam railway (Chemin de Fer de la Baie de Somme) which runs around the bay from le Cayeux to St Valery and le Crotoy which can offer a perspective you will not get from the car or bus. Bicycle hire is also popular and quite widely available – mercifully the area is flat and the area is exceptionally well-provided with wide and safe cycle paths which extend for many kilometres. There is a Festival of Steam (Fête de la Vapeur) next 2-4 July 2021! Historically the port was the departure point for William The Conqueror’s invasion of England in 1066 – but perhaps it is time to forgive that little transgression. The town’s maritime heritage is most obvious in the little fisherman’s houses which line the steep descent of the rue des Pilotes. Further on are the old fortifications (linked to Joan of Arc). Based at St Valery-sur-Somme is the navigation boat (bateau baliseur) Somme II is a recognised historic monument, which has been voted as one of the best French monuments by the French (France2 TV). It now offers pleasure cruises around the bay. Nearby there are the Jardins de Valloires – an impressive garden adjacent to an Abbey down a small valley and divided into 6 themed gardens – looks particularly good in the Spring.